It's about time I posted some pictures of modelling I've done on here. I started building a pizza layout about a year ago and this is how far I've got! Great start. What other details have you got planned for it? 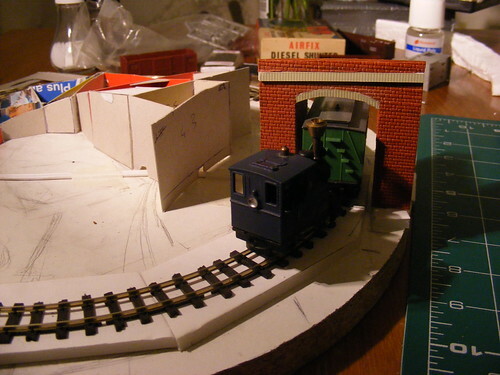 I'm considering n009 for my next layout, and may do something similar. 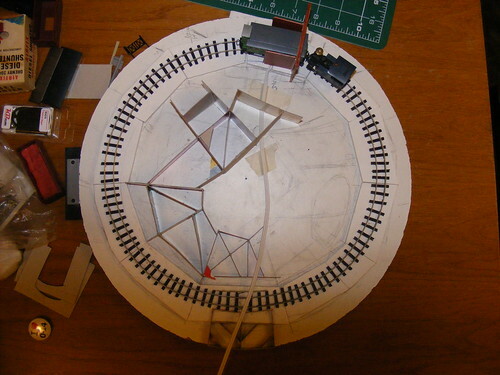 I saw a great round-shaped layout at NGWS (shepton) where the whole baseboard rotated at the same speed as the train , but in the opposite direction. The overall effect was grat, watching this little tarin as the background scenery rolled by. A little 'pizza' like this would be a grat candidtae for soemthing similar. Was it Belfield Hall Estate Railway? That was the layout that first inspired me to think about pizza layouts. Carl's site was what got me started on this though. I had thought about making it rotate but I'm not sure if I will or not. 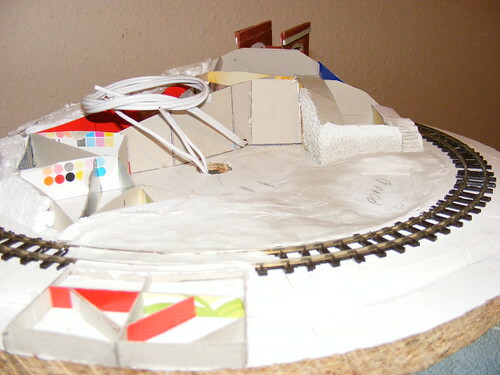 The card cereal packet bit will be a road which will cross the bridge at the top and a level crossing at the bottom. They'll be a flint cottage* in the middle and the oval which is draw on the board will be a pond. They'll be a couple of small trees near the bridge. * Assuming I can make something look like flint! Current plan is painting Wills cobble sheet. I'll try it out on a low wall first. On the pizza layout I've added some more bits of cardboard to for the base of the hill and built a mock up of the cottage. It's not got a roof but it gives a better idea of what the finished layout will look like and has helped me think about how the cottage should look. I'm still thinking about how to model flint. I don't think the Wills cobblestone walling sheet it going to work after comparing the size and density of the pattern to some real flint walls. So I need a new plan. Does anyone have any suggestions? 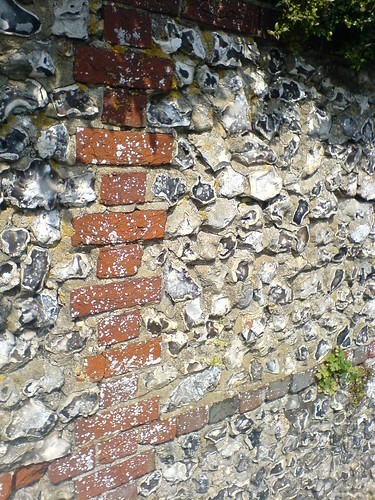 I take the point that the "cobbles" are on the large side, but at least around here (Sussex coastal plain) bricks are not a major part of flint walls. Stand-alone walls (gardens, parks, fields) might have a cap (unsure if they're tiles or shaped bricks), or the "mortar" might only be smoothed over. 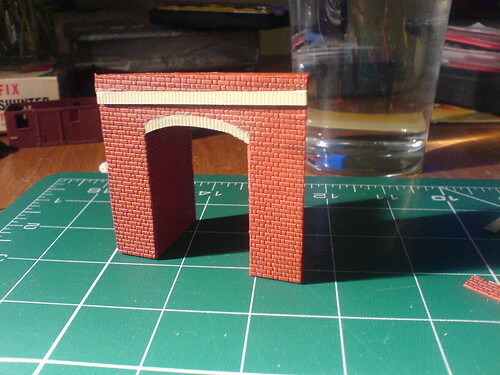 For buildings, perhaps bricks forming the corner (usually only one brick per row, long side alternately one wall then the other), or stone, or even mortar (?) smoothed over and painted white (either as a corner pillar between slate walls, or as a white smooth front wall continuing around the corner. Bricks within a wall is very uncommon. Possible ways forward with the flint - fill "between" the stones with something (milliput), perhaps spread on with a toothpick. Then paint this as the "mortar", not forgetting the yellow-green colour where the moss has taken hold. Hmm, that sounds like it might easily be a recipe for frustration. Or even use a fine brush to put a thick coat of enamel between and on the sides of the stones to fill out the dips. Probably gloss, it seems to go on thickly when I'd rather it didn't, then paint over it with matt enamel. For the tops of the stones, try using an abrasive pad to knock them down - many flints, particularly in field walls, seem to display a blackish split face. 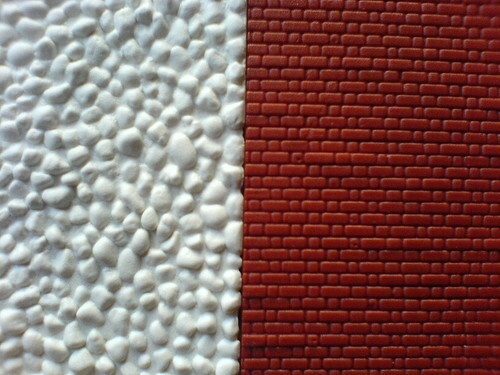 Or, if anyone makes plastic 2mm cobbles, perhaps try a sheet of those. Dunno, I don't think I've seen any except in card. To provide texture on the outside of a building, my current preference is for thin plastikard sheets (Slaters). They're something like 20thou thick, which makes them easy to cut. My current project (Austrian-style Bahnhof) needed a bit of texture on the walls, and what I'm trying was, I thought, "pebbledash". Not ideal for my purpose, but it will suit me for the moment. I've just checked my Squires' catalogue - it's Slaters S0423 which they describe as flat/random pebble walling. The downside is that it seems to be marketed as suitable for 4mm and 7mm! Certainly, some of the stones in it are big. It also doesn't have a lot of depth to it. If you have access to anyone who stocks this, you could take a look to see if it would help. If you are able to use filler or whatever on the Wills cobbles, bricks from a Slaters sheet might help - they're thin, so you might be able to stick them onto the cobble sheet, or sand it and stick them on, instead of sawing / filing out the cobbles where the bricks are to fit. And if none of that helps, I'm told that brick and wood are very fashionable for new construction - maybe 'Flint Cottage' was demolished and rebuilt in brick/wood leaving only a flint wall as a reminder of what used to be there ? 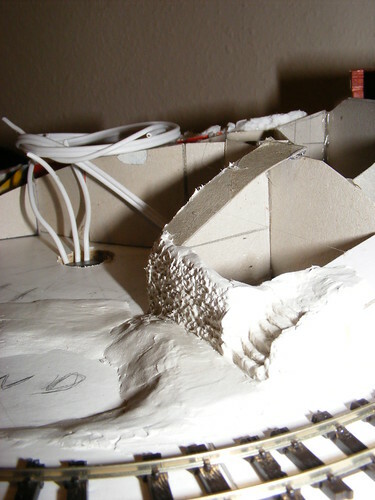 In David Rowes book of Architectural Modelling (a bible for model buildings) on page 24 it suggests he achieve a good effect for 'pebble walls' with use of making a stamp which was a piece of brass 2mm thick to which he drilled random sized holes, and then filed the holes to suit the size and elongation he wanted without breaking through, he then soldered a handle onto it, and then used it to press into Daz modelling clay. If you have ever seen a David Rowe layout you will know that along with Roy England his quality was amazing. I think I would try this proven method if you are unhappy with the wills sheets, as once you have done the pain of the embossing tool then you can make as much as you need. For Flint he added that you can flatten the protrusions to achieve the effect for flint. Hope this helps, and I highly recommend this book which includes his 009 town layout called Axford. It is a really inspiring layout. Thanks for the suggestions guys! It's been far too long since I last posted about doing any modelling! The pizza layout had been left on top of an old chest of draws in our spare room for a while. I dug it out the other day and found something that I'd forgotten that I'd done. I had been thinking about making a base which the layout would site on which would allow it to be rotated. 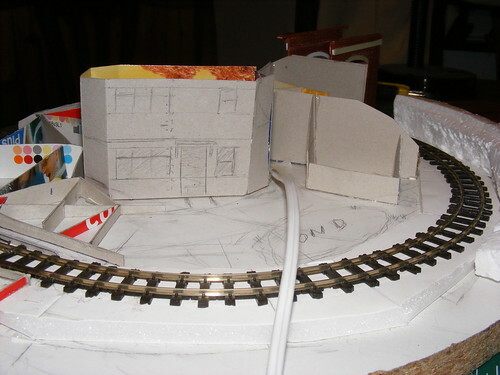 I decided to use a stereo and jack in the centre of the layout to supply power and act as the axis of rotation. I used the lid from a jar of jalapeÃ±os to attach the plug to. The layout does rotate but it's rather wobbly as I expected. 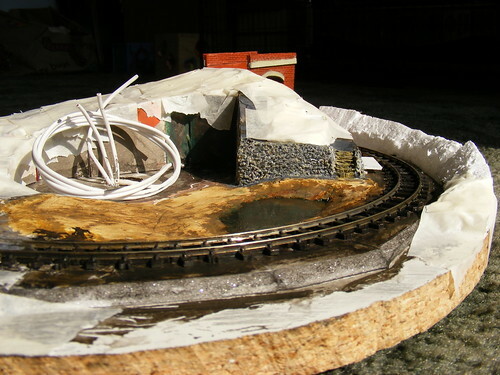 I'll build a base with some runners about two thirds of the way out to take most of the layouts weight. I've not worked out exactly how that will work yet bu I have an idea after reading Nigel Burkin's article on building a fiddle yard. He made the sector plate part of the yard slide on plasicard - the same thing would probably work for rotating the pizza. I've also made some progress with the scenery. A trip to Hobby Craft to get picture frames also allowed me to get some Das modelling clay. I tried out building a wall (using the highly scientific method of poking the DAS with a cocktail stick) and some steps and then decided to do the level crossing and the area around the pond too. We'll have to see if I can paint the wall to look like flint and building the cottage will be more of a challenge! I've painted the pond a muddy green colour and the wall black - I'm going to try dry brushing on lighter colours to build up the flint. I probably wont get a chance to do that for a few weeks though. this is cool, , makes me think of the most unthinkable. a frisbi train layout!!! lol can you imagine? zabdiel wrote: I decided to use a stereo and jack in the centre of the layout to supply power and act as the axis of rotation. I used the lid from a jar of jalapeÃ±os to attach the plug to. The layout does rotate but it's rather wobbly as I expected. Great idea. Maybe its the type of socket used that has made it wobbly. Try a 'sleeve' type rather than a 'frame' type and see if that helps. It's the fact that I attached it to a jalapeÃ±o jar lid (why didn't I just claim it was a jam jar - that's so much easier to type ) and the fact that there I was spinning it on the jack without any other support. I've had a couple of suggestions on my thread over on ngrm-online about how to stop the wobble. My favored solution at the moment is to support the layout with PTFE furniture slider things so it glides round nicely. Its a great idea for a layout, I really like it. Have you thought about plonking it on an old hi-fi turntable and get it rotating at 33rpm ? I think that would look pretty good with a loco running the opposite direction ! Nice stuff, depending on this turn out might have a crack at something like myself. 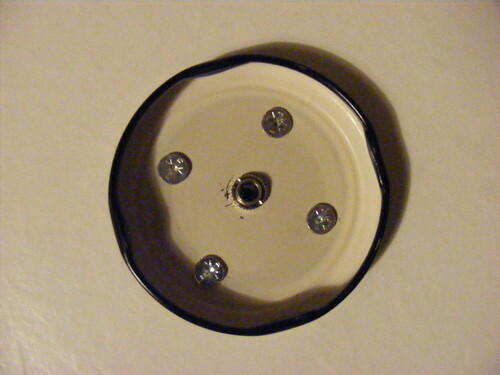 DrStroganoff wrote: Have you thought about plonking it on an old hi-fi turntable and get it rotating at 33rpm ? My Egger-Bahn loco runs at about that speed! I've been stuck in Birmingham this week (working) but I'm hoping to get something done on it in the next couple of weeks. I'm having a lazy weekend this weekend after working 12 days in a row. I've not thought any more about rotating and I've been putting off the painting the wall for ages. A few weeks ago I had a go at painting it and wasn't at all happy with the results. After a third attempt I'm still not happy but since the wall is going to have plants growing up it I may leave it. I've also put some more polystyrene in between the card framework. The theory is that they'll be something under shell of the landscape which should make planting trees easier. I've covered the who lot is masking tape and also slapped some dirty black paint over the track. The bridge now has some retaining walls on the inside of the curve. 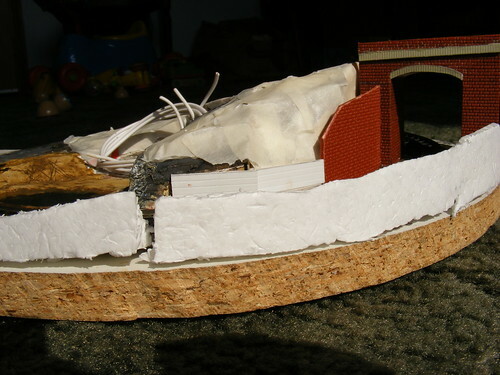 I'll add some wooden planks to hold up the steeper bits of embankment either side. I've also put the first layer of glue on the pond - but I touched it before it was dry and there is a finger print. I'll know for the next layer.